Did you know that by simply eating oysters in certain restaurants in the central and eastern Virginia region, you become a participant in oyster restoration? 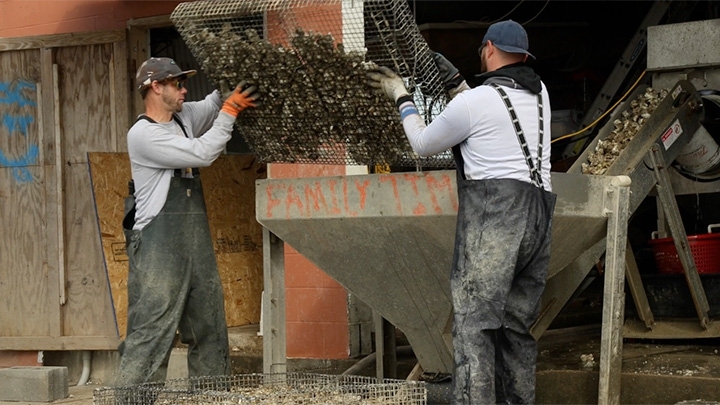 The Virginia Oyster Shell Recycling Program (VOSRP) is a public-private and nonprofit collaborative effort of the VCU Rice Rivers Center, taking shells destined for the trash and returning them to the Chesapeake Bay. The VOSRP collects from more than 60 restaurants, oyster roasts, and 30 public drop-off locations throughout the state. Locations include Charlottesville, Richmond, Tappahannock, Woodbridge, Williamsburg, Newport News, Hampton, Norfolk, Suffolk, Chesapeake, Portsmouth, VA Beach and on the Northern Neck of Virginia. Since 2013, the VCU Rice Rivers Center has facilitated the collection of waste oyster shells from restaurants and returned them to the Virginia portion of Bay to help restore wild oyster populations, improve water quality and provide new fish habitat. On June 15, 2017, Ellery Kellum Rock, an oyster reef in Irvington, Virginia, was added to the Virginia Treasures list. The reef was established by the shells collected and cured by the VOSRP and by WE Kellum Oyster Company. Once oysters are harvested, they are boxed and shipped to restaurants. When the oysters are consumed, participating restaurants place the shells in a VOSRP bucket, where volunteers collect them and deliver to a local storage container. The shells are taken to VCU Rice Rivers Center to cure for about a year, then seeded with spat (baby oysters) to attach and grow. Once seeded with spat, each shell might return 10-15 animals back to the Bay. Oysters filter more than 50 gallons of water per day, processing plankton and sediment that in excess cloud waterways. In Virginia, oyster reefs provide habitat for blue crabs, striped bass and red drum and help to mitigate storm-induced shoreline erosion. As those reefs decompose, they act like an antacid and locally help balance the pH in the water. • Recycle your own shells at one of our public drop off sites. • If you have a home on the river, become an oyster gardener and grow oysters on your dock to help restoration efforts. • If you are a business and want to participate, contact us to find out how you can become involved. • Donate to the VOSRP to ensure we continue to grow. For further information please contact VOSRP Director, Todd Janeski: tvjaneski@vcu.edu or 804.828.2858. For more information about VCU Rice Rivers Center and the Virginia Oyster Shell Recycling Program, please visit our website.